I don't deny that I like Kyuranger. 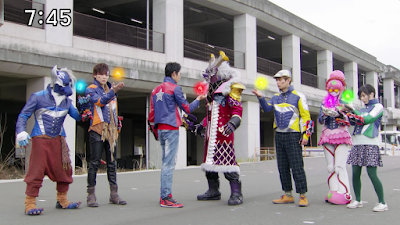 I don't know if should say this now but I feel that the show is miles better than last year's Zyuohger while some may think otherwise. It's already 22 episodes and I feel like making a rant before. Now I'm going to do it again since no matter how much I like the show, I always tend to do CinemaSins even with shows and video games that I like every now and then. So what's my latest concern? Is it me or is Kyuranger going overboard with the hero count? While I'm open to an increase of characters but too many characters can be a bad thing. I remembered watching Eto Ranger and I don't think watching this season should be a problem. So what's my concern? I'll give my thoughts on the core team first. It's interesting to have a team of not just humans but also aliens and robots. Lucky's happy go lucky behavior is somewhat justified by his tragic past. Sure he's an idiot but at he's much better than a teleserye guy. Hammy is a ninja though I wish they can develop her some more. Garu and Stinger are tragic characters which may provide balance for the show. Naga and Balance aren't interesting. Raptor's not your typical pink ranger but isn't all that interesting. Champ has a good backstory but it seems to be on stale after Scorpio got destroyed. Spada seems to be nothing more than a chef on board when he's not fighting. I think it's going to be hard to spread things out. I hope that the problem can be lessened soon. I don't know what exactly to think of the more relaxed commander. He had his past where he was rash and maybe, just maybe his behavior tends to be be his way of making up for his tragic past. He may be a cool character but I think he's no match for Dekaranger's Doggie Kruger. Hopefully, they can try to make him better than he is right now. Somehow, I feel the newest character appeals to my inner youth. 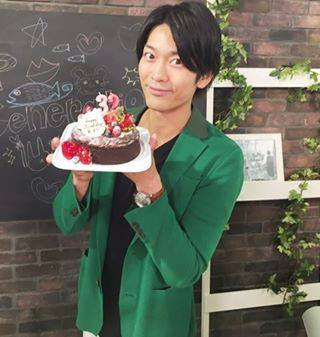 While most of the cast members are really young people but Tsurugi Ootori's actor Keisuke Minami is already 32 years old. Did he accept the role to show that he's 32 and still likes Super Sentai to a certain extent? While I did lose enthusiasm for Super Sentai but I figured out I just needed a break and focus on other new school stuff. What's funny is that while I took a break from Super Sentai i was still watching new school Kamen Rider while I was enjoying some new school K-Drama or Taiwanese drama. I may not like Tokusatsu in general as much as I used to but I can still enjoy the latest seasons regardless of my age. I have this guy to thank for surging me up like a phoenix. I hope he doesn't end up stealing the spotlight in future episodes. So it's in a parallel Universe? 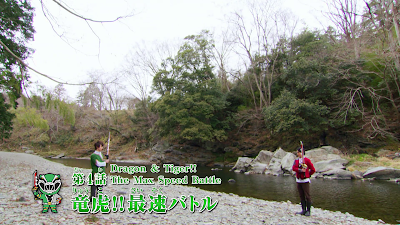 Personally, I like the idea of taking Super Sentai in different continuities every now and then. I think that using the Multiverse format is better for writing Toei's brand of Tokusatsu than always relying on a single universe. It's like how Gokaiger can be viewed as part of the VS. Universe while Kyuranger might as well be viewed as the "Kyuranger Universe". 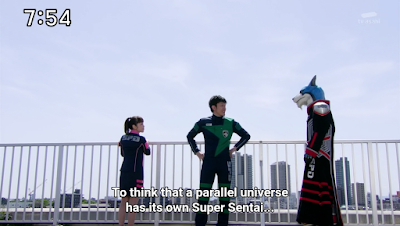 Most Super Sentai series are meant to happen in their own continuity and VS. Movies are meant to happen in an alternate continuity. I think the use of the Multiverse format is beneficial in many ways. 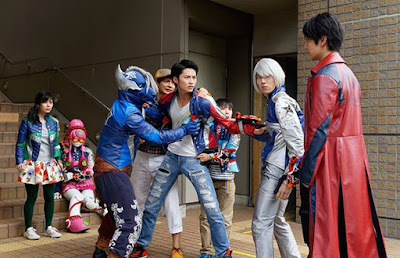 Kyuranger's story actually demands it to take place in another Universe. The time and setting is where the Space Shogunate Jark Matter has taken over the Kyuranger Universe. 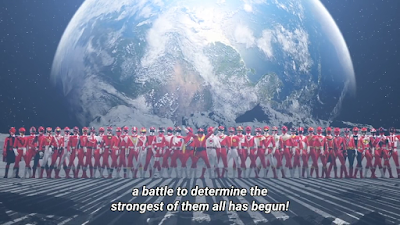 At first, it had me wondering where in the Earth are the 40 other Super Sentai when the Earth needed it? The answer is that was revealed that most Super Sentai series they usually take place in another continuity. It's like how Winspector, Ohranger and GoGoFive all take place in the year 1999 (in terms of plot) yet they are all separate from each other. I don't see any reason why Commander Masaki won't show up even as a guest star in GoGoFive. He freaking showed up in Exceedraft when the evil demon Iwao Daimon was about to take over the world so he has no excuse not to show up with Grandienne's evil. 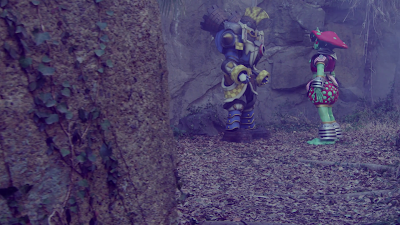 Unlike Power Rangers, Super Sentai tends to make most of its seasons self-contained. 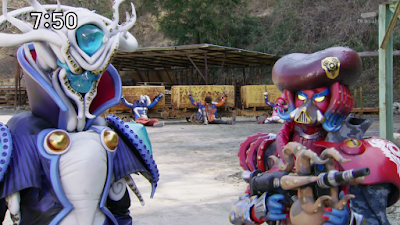 The villains in Kyuranger operate quite differently. They have taken over various planets in the Universe while they have concentrated their operations on Earth. What I like about Kyuranger is that some episodes just don't take place on Earth although majority of the episodes from the first up to the most recent are on Earth. I gave a thought on some of the villains and what I think about how things are written. Don Armage does have the potential to be a creepy, scary villain as he rules the galaxies but my problem with him is how often he remains hidden. He's supposedly Super Sentai's version of Darth Sidious so maybe he's not that active. But what I thought about it that what's the secret he's hiding? Is this guy from Earth? How did Tsurugi Ootori put an end to him years ago? Why is he suddenly still alive? 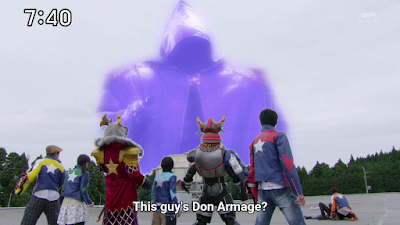 I hope that there will be a good plot twist to Don Armage's history. Ikagen and Madoka started out as a good assassin duo but they were killed off so easily. I thought about how easily Ikagen got killed. He was a badass assassin then Madoka gets killed off so easily. I don't know what to think as of yet. It reminds me of how Goranger and Gingaman tends to change enemy commanders so easily after one drops, another comes forward. It was nice to have Scorpio around but I felt it was a waste to just get rid of him immediately. What are the producers thinking of getting rid of such a potentially powerful plot? I wanted to expand the conflict of Stinger and his brother Scorpio for more episodes. Sign... it's really a disappointment not to expand the plot a little more. I hope they can replace Scorpio with a better, more evil villain or better yet I hope we get a villain who'll say, "LUCKY I AM YOUR FATHER!" 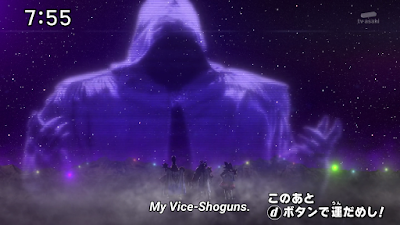 Hopefully the Vice Shoguns will be a better replacement for all the potential that was killed off so early. Is killing off the villains a way to sell more Bandai merchandise or is it a way of showing that Don Armage's network isn't easily destroyed? You decide. It's nice to try something new and it's by trying something new we get good shows. But there's always going to be some mistakes along the way. But I'm still enjoying Kyuranger in spite of whatever mistakes I've just mentioned in this post. Enjoy it but don't forget to share what you think about it. As said, I'll still continue doing some weekly posts (but don't expect updates on toys) though I may cram up certain episode reviews in one post whenever I feel like it.